I have moved from the more common glued tenon neck joint to a bolt-on-bolt-off method. This makes the neck quite easy to remove to help with repairs and adjusting the neck set angle should it ever be needed. The bolt-on joint is very strong, and uses high-tensile bolts through the top block into barrel nuts buried in the laminated heel tenon. It has another advantage as well: the neck can be quite easily removed for travelling. 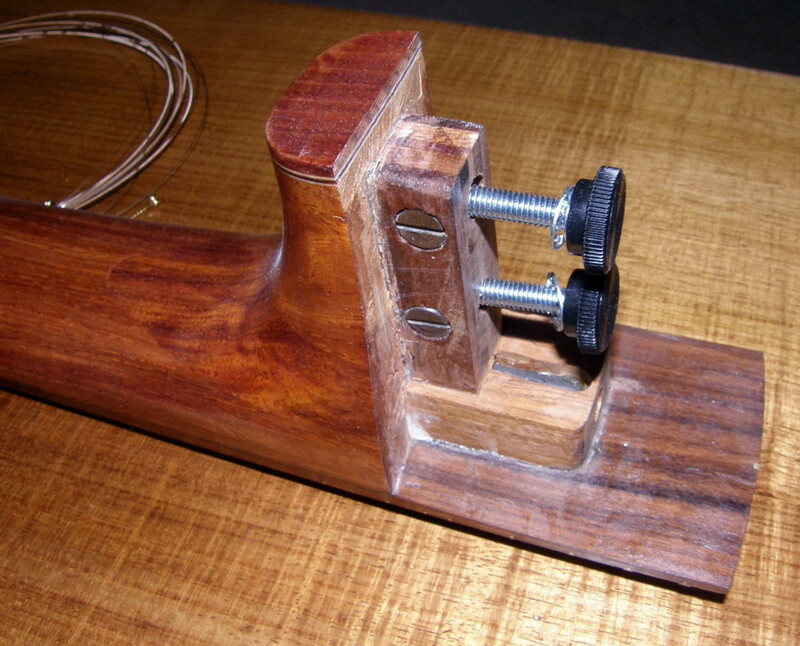 To do this, you detune the strings and remove the bridge pins to release them from the guitar body. There’s no need to worry about taking them off the tuning pegs. Reaching in through the soundhole allows you to undo the neck bolts and slip the neck off its restraining pin. Once disassembled the instrument will fit into a compact travel case you can take with you as cabin luggage if you want.